With wild populations in serious decline in all six countries in its native range, the Yellow-naped Amazon (Amazona auropalliata) is at risk for extinction. Beginning in early 2007, WPT provided a Small Action Programme grant for a research project to learn about range and habitat use of the Yellow-naped Amazon in Costa Rica. Also, in response to heavy trapping, New Mexico State University researchers partnered with WPT, the Area de Conservación Guanacaste (ACG) and Santa Rosa Park, in funding an educational program. In 2015, support was given for surveying and protecting a group of Yellow-naped Amazons near the island of Roatán, off the coast of Honduras. WPT has recently backed surveys in Costa Rica and Nicaragua, and an effort in Mexico in the Biosphere Reserve La Encrucijada to disperse environmental education, monitor parrot populations, and stop illegal trade. The survey work found that there are less than 1700 individuals on the west (Pacific) coast of the species' range from S Nicaragua to N Costa Rica, a marked decline from counts in 2005. Focus of future work: WPT continues its support for efforts taking place in Mexico, Honduras, Nicaragua and Costa Rica. In Costa Rica there are plans to implement monitoring of the wild Yellow-naped Amazons there, and continue counts often to track the effectiveness of release programs. WPT will also support the confiscation of illegally held captive birds, which will be rehabilitated and released if possible. Any birds that are injured or unable to be released will be held back for a breeding program. A release program and community awareness will be developed in select locations in the former range of these birds, building support for the value of these parrots. 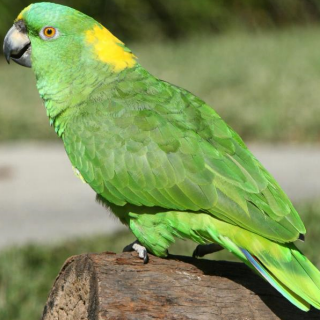 History: The total population of the Yellow-naped Amazon may be as little as 10,000 (J. Gilardi in litt. 2011) or as high as 50,000 (A. Panjabi in litt. 2008). An overall decline in population has occurred throughout the species’ range due to trapping for the wild bird trade and the loss and degradation of its habitat. Interviews with local people in at least one area provide anecdotal evidence that the species has lost ground or disappeared entirely since the 1950s and 1960s (R. Bjork in litt. 2011) (Grijalva 2008). The populations in Costa Rica, Nicaragua and Honduras also appear to be declining (T. Wright in litt. 2011, Lezama et al. 2004, Wiedenfeld 1993). In Nicaragua some sites that had previously held large numbers may now hold very few (M. Lezama per C. Dahlin and T. Wright in litt. 2016). Formal surveys at 6 sites in Costa Rica have noted a decline of 48.9% between 2005 and 2016 (C. Dahlin and T. Wright in litt. 2016). Climate change may also have an impact on the species as there have been hotter and longer dry seasons, though the impact of this currently unknown (C. Dahlin and T. Wright in litt. 2016). Ecology: The Yellow-naped Amazon favours deciduous forest, pine-oak woodland, gallery forest along waterways, arid to semi-arid savanna woodland, and dry scrubland with remnant woodlots or scattered trees. Birds are found in pairs or flocks with larger gatherings at communal roosts and feed areas. They feed on seeds of Cochlospermum, Curatella, figs and ripening Terminalia fruits. Bay Island birds feed on pine cones.